Re: Pet Thread #Meow Woof Squeak! I want a pet ferret. my dad has like four dogs. one is a regular-sized dog, a mix between a golden retriever and a yellow lab. she looks nice because she has the goldish color of golden retrievers, but short fur like a lab. three chihuahuas too, a pure white (pure, excluding a spot of creme on his head) one, a black and white one, and a brown and white one, who is the mother of the other two. That's adorable! dogs are sooo snuggleable, that's why I like dogs. Ant that's reason why I'm not wishing to get a dog. I see them everytime I visit petland, they are cute but they stink and I just have no idea how to play with em. speaking of my cat,Scratch drew this for me. Me and ma kiiteh. My cat is snuggly no more, she just doesn't care about me much as she used to do. :cry: My cat is snuggly no more, she just doesn't care about me much as she used to do. Try giving her some catnip. It works for me most of the time. those look like some kinda cat drugs to me... IDK I just never thought of using it. Catnip is good for their digestive system, so its good to give them a little every now-and-then. Whenever I give my cat some he either gets really playful, or just curls up next to me. ahhhhhhh, my cat is being spayed tomorrow. is there any side effect? what if she gets unsunugglier? ahhhh poor my girl. She might get a bit lazy afterwards. arghhhhh, my poor little girl is now spayed, ok that's ok. but the vet tattooed numbers on of her ear so that they can track of her, without asking me. I'm kinda sad, she just doesn't look good with numbers written down on her ear. I know it was for good but they should have asked my permission before it. Here is a picture of my dog! Thanks to my Trumblr blog! This is Tiger! He is playing his favorite game: making sticks into smaller sticks. And as mentioned before, my friend's dog, Lou the Hell-Corgi! In case you are wondering, no! He was not provoked! My only crime was I sat down next to his master and he decided to punish me with death! 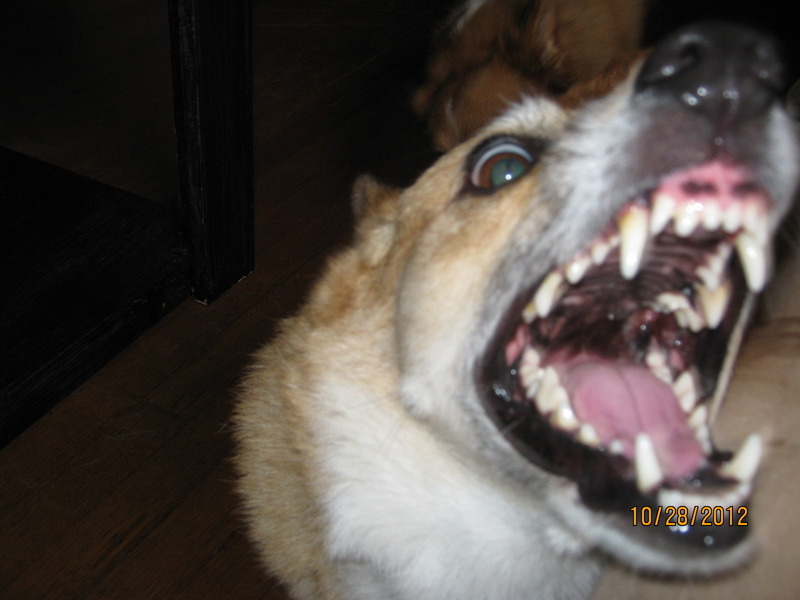 Corgis are evil! My yorkies have a habit of smiling at people when they're excited, but guests usually think they're trying to show their teeth. I'm sorry, but all I see in that picture is an excited dog who wants to play. I've seen and been around enough dogs to tell when they want to play and when they mean business. But I could be wrong about it. Seeing a picture and actually looking at the dog are two totally different things. Anyway I love golden ritrivers. Their furs are gorgeuos and they look so pretty. An important thing to remember about dogs is their teeth don't go away. They're visible no matter what facial expression it's making unless the mouth is closed. Just 'cause sharp teeth are showing doesn't mean the dog is threatening you with them. No. I am pretty sure Lou wanted me dead. He was lunging for my right arm in that shot. He was barking and snarling. Its worth noting that Lou is the name the animal shelter gave him, but the proper spelling should be "Lu" because his papers state his full name as "Lucifer". 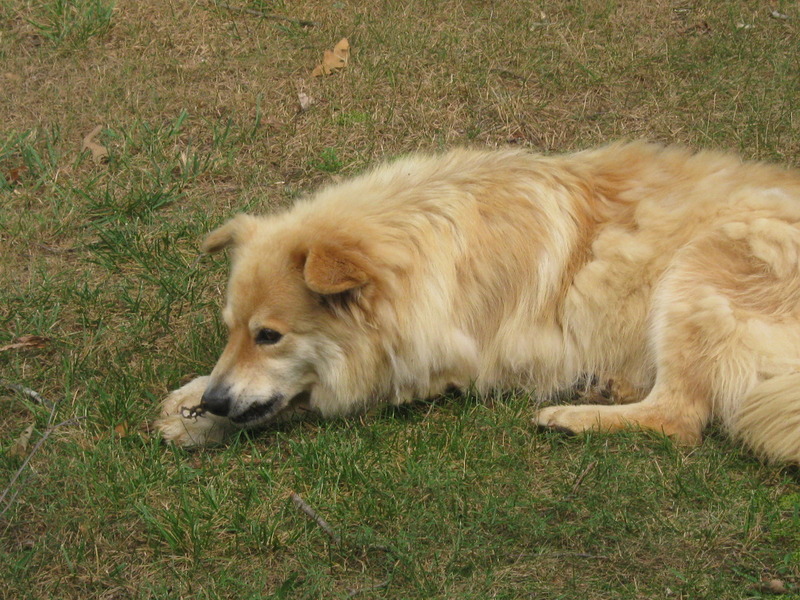 Also, Tiger is a collie/chow mix. He too is a rescue case. My cat is a offspring of stray cat. She is kinda wilder than off springs of indoor cats. One of my cats was rescued. And by that I mean he was found soaking wet on the side of a highway mid October. He was big enough to fit in one hand, and there weren't any houses anywhere nearby (there was a river). Had him for eight years. That's so sweet of you all to take him in! Tiger would gladly let you hug him! He loves people! Other dogs though, he tends to fight sometimes. He beat up our neighbor's Husky once. Help my cat wants to play with me, but I can't entertain her well anymore. she doesn't like to play hide and surprise no more. any of cat owners please respond. how do you entertain your cats? Welp, this is not a good week to be my pet. My dog lashed out aggressively and we almost ended up giving him away, now we came to the decision to give him to a dog trainer who will keep him until January, then we'll get him back. My cat is showing a lot less energy than last week and is walking very slowly around the first floor of my house. She isn't jumping onto my bed or her food table (We have her food elevated on a table) and she's been looking for small dark places like behind/under my bed. I'm scared for her because I've read about that behaviour in cats and she is not pregnant. 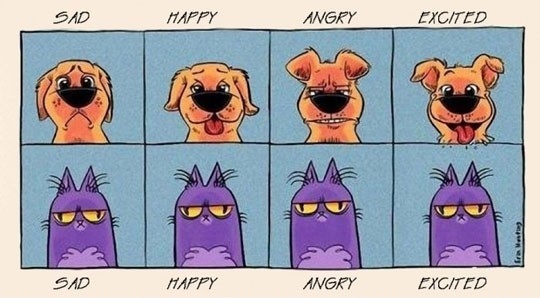 Cats tend to make their own entertainment. All I can say is, catnip. You're cat will love you forever...or just 15minutes, but still. I've been having problems with two of mine fighting, they've never done it before. Luckily there's a third who breaks them up, neither of them want mess with her. Use paper bags and toys they want to bat at I guess? she relies on me for her entertianment rather than her own. Tough she plays catching some odd things, like a pen cap, button.. I think some of my stuffs are gone..
@Punchy how is it like to have multiple cats? And my cat already loves me so much. @Sleet you are definetely not a cat owner XP when cats are young they do play with toys but as they grow up, they ask look for live entertianment. My two cats have always enjoyed sitting in my lap while playing videogames. I make it easier for them by having a blanket on my lap everytime I do so in preparation for them. Also makes my legs warm. Re: Pet Thread #Nyang! Mang! Jiik! did they just sit on your lap just because they felt like it one day? or did you train em? I actually hate golden retrievers. I have been around big dogs my entire life. Dog breeds that have reputations as being aggressive. Dobermans, Rottweilers, German Shepherds, Pit Bulls, etc. But the only time I have ever been seriously injured by a dog, it was a golden retriever! I didn't need stitches but there was a lot of blood! @Punchy how is it like to have multiple cats? Yeah, anymore than 2 is a problem (and there are 3 here). They fight for your attention sometimes, and can get in the way (under your feet). I love 'em though. I actually hate golden retrievers. Same here, but for different reasons. I used to not like any dogs at all, but there are certain breeds that I've grown to like more than others. I should have paid more attention to your post, If I did, I could have warned you about your cat's health and told you to go see a vet asap... that was a clear sign of need of medical attention. I feel guilty as the owner of this topic. I'm sincerely sorry for your loss. I was wondering what happened! It was either that or a trickster moderator. A trickster moderator who would inevitably be going to the hospital for furret bites. Whyyyyy does this topic even need hashtags in its title? Pleeease don't do that. I have two cats. One is a Russian Blue and pretty smart, though he's overly attached to me and whines incessantly whenever I'm near. This gets annoying when I'm trying to sneak around at 3 in the morning. He hates his belly being rubbed/scratched. xP The other is a Siamese, who's a bit limited in the brains department. His skills include opening and slamming the doors on cabinets, defecating NEXT TO the cat litter, and in general being a pain in the tail. They spend a lot of time harassing each other. Hash Tag Is My Code Of Title. My cat once tried to open a door by touching a doorknob. cats are smart too. And he opens the cubboard too. That's very neat, depending on the cubboard of course. X3 I'm just so surprised that our dog has so far on account done it six times and everyone that calls for her hears her scratching the door. Even better when yo uconsider the first time she did it she somehow locked the door too. The family is, by definition, flabbergastered that she is able to shut the door in the first place since we have no idea why she shuts it, but it's nonetheless come to the point where i laugh everytime she does it because it's no longer a one time deal.